2 lift kit, Gold racing rims and BFGoodrich tires, roof rack, front push bar, Rally Armor mudflaps and more. This black wagon has a manual transmission and is powered by a 2.0L H4 16V GDI DOHC engine. Given that economical motor it gets 10.5 L/100 km in the city and uses just 8.1 L/100 km out on the highway according to Transport Canada. Our Crosstrek's trim level is Convenience Manual. This surprisingly affordable crossover comes loaded with a 6.5 inch infotainment system with Apple CarPlay, Android Auto, STARLINK smartphone integration (including Aha radio), USB port/iPod control, and steering wheel audio controls. You'll also get aluminum alloy wheels, and a rear view camera to help get into those crowded trail heads. 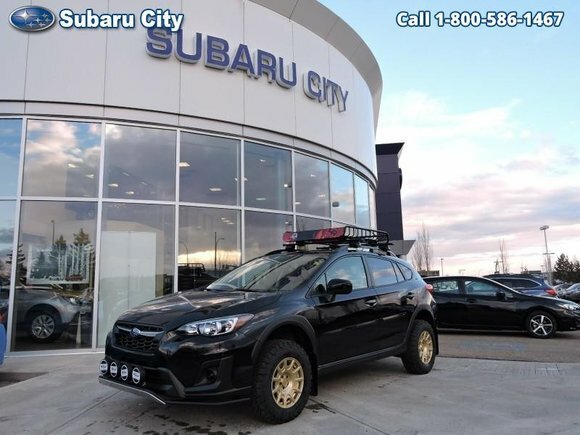 Hot features: Rear View Camera, Aluminum Wheels, Keyless entry, STARLINK, Bluetooth, Steering Wheel Audio Control, Air Conditioning, Touchscreen This vehicle has been upgraded with the following features: Lp Aventure Off-road Package.. This is a demonstrator vehicle driven by a member of our staff and has just 257 kms. 401 mm|Two 12V DC power outlets|Transmission hill holder|Seatbelt pretensioners: Front|Rear center seatbelt: 3-point belt|Door reinforcement: Side-impact door beam|Engine immobilizer|Cargo tie downs|Floor mats: Carpet front and rear|Cupholders: Front and rear|Door pockets: Driver and passenger|Seatback storage: 1|Tires: Width: 225 mm|Tires: Profile: 60|Tires: Speed Rating: H|Diameter of tires: 17.0"|Type of tires: AS|Tires: Prefix: P|Left rear passenger door type: Conventional|Rear door type: Liftgate|Right rear passenger door type: Conventional|Body-coloured bumpers|Integrated roof antenna|4 Door|Driver airbag|Manual child safety locks|Rear View Camera|1 USB port|STARLINK/Apple CarPlay/Android Auto Mirroring|Halogen aero-composite headlights|LP Aventure off-road package. Want to try the 2019 Subaru Crosstrek Convenience Manual LP Aventure Off-Road Package?